If you’re going to visit the birthplace of the skyscraper, you may as well stay in one. And where better than one of Chicago’s true originals, the 1923 Alfred S. Alschuler-designed London Guarantee Building, now home to LondonHouse, a luxury hotel. With 452-rooms spread across Alschuler’s landmark structure and a new accompanying 22-story Modernist glass tower designed by local firm Goettsch Partners, LondonHouse has already established itself as a city beacon, wrapping around both North Michigan Avenue and Wacker Drive, and overlooking the city’s river. Topped by a refurbished historic beaux-arts cupola, now an event space and the crowning glory in a tri-level rooftop, the property is remarkable for its recreational areas. 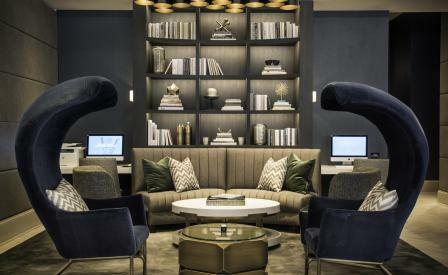 They include a full service spa and a restaurant led by Executive Chef Riley Huddleston, as well as a slick second-level lobby bar fronted by floor-to-ceiling windows that is bound to pull in guests and Chicago’s movers and shakers alike. The interiors have been designed by Simeone Deary Design Group, who were guided by the building’s original historic detailing and 1920s opulence. As such, guest rooms pay homage to luxury automobiles of the time, an influence which manifests itself via sleek, elegant furniture upholstered in plush materials, and fumed eucalyptus woods which mingle with a palette of warm greys and crisp whites for a result that successfully brings the city’s golden age to the present.